In a recent study by the Business Standard (BS), PSUs (non-financial) have logged in an average ROE (return on equity) of 10.5% for 2015-16 (FY16). That's noteworthy for two reasons. One, amongst the top 11 (eleven) business groups in India, this ranks as the fifth (5th) highest. Second, this is a better performance than many of the India's large business groups such as AV Birla, Vedanta, Bharti, JSW, Anil Ambani & OP Jindal. 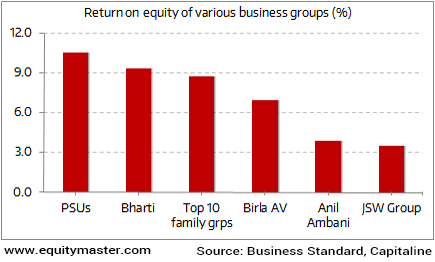 The groups that have performed better than PSUs are Tata, Mahindra, Adani & Mukesh Ambani. It seems that despite all of the brickbats, PSUs put together are doing a pretty fair job navigating the slowdown that has gripped the economy.